This is Malcolm McNeill’s first book, and he has proved straight away, what a wild and fertile imagination he has. 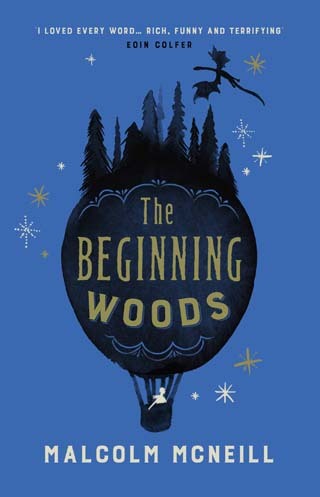 The Beginning Woods is an older children’s book, about a boy called Max, who lands at the Surbiton Centre for Orphaned and Abandoned Babies from – who knows where? – with a spooky stare and a strange unnerving presence. He is, it is clear, a seeker of truths, an adventurer. And adventures he certainly goes on to have. This is where I abandon any attempt at explaining the plot, because things get so fantastical and confusing, that before long, I was lost in a wild wood of my own, and simply surrendered to the flow of images, verbal twists and turns, and preposterous, magical happenings of the book. It is, to be sure, a steaming cauldron of complex ingredients, and I am not quite sure what kind of meal was made out of it by the end. There are obvious influences and references to the wider world of literature here. Chiefly, Philip Pullman, whose wonderful Northern Lights trilogy introduced us to cosmic philosophising at a sophisticated, elevated level. And from the adult canon, Audrey Niffenegger’s Time Traveller’s Wife – where the hero travels back and forth in time, shedding whatever he happens to be wearing at the time, and wandering naked into parallel worlds. But McNeill’s grasp on narrative is not nearly so tight as these writers, and I was left wondering how easy it would be to follow his ever-shifting plot, even for an older, confident reader? Often I was left baffled: a little too baffled for comfort. Still, there are glimmers of deep philosophy here, of questions about our humanity, and who we are, where we came from, that are exciting and intriguing. And the characters who dance through the book’s pages are vivid and fun. McNeill has proven his ability to conjure deeply imaginative worlds, peopled with vivid imaginary personalities. I would love to see him write something next, that fastens itself more securely to a guiding narrative. But maybe that just betrays my rather plodding – and adult – feet of clay?